You are receiving a fun, winter craftivity for teaching the concept of main idea or main topic! 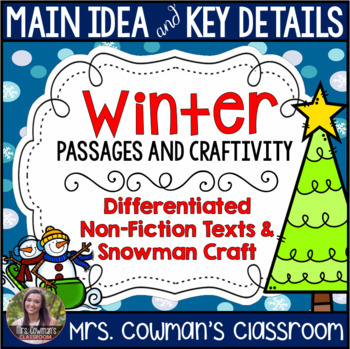 You'll find texts about Winter topics- perfect for engaging and grabbing the interest of students! 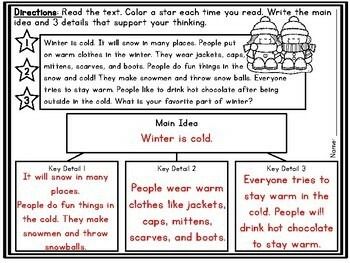 Let your students join the winter fun by finding the main idea and the supporting details and then recording it on a snowman graphic organizer craft! This also makes a creative bulletin board or school hallway display! There are 8 different themes/main topics included in this packet. There are two versions of the worksheet. One page has lines to support beginning writers and the other page has no lines for students who are stronger writers to allow them to write more. 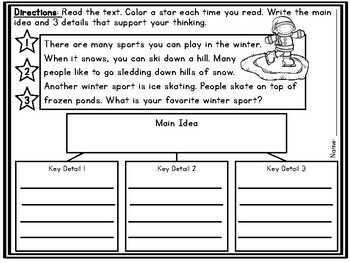 These graphic organizers will be helpful to students as they determine the main idea and find the details that support it. The passages are the same on both pages. 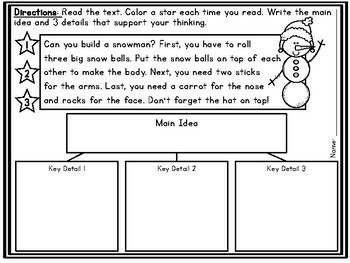 The Snowman "Craft" Graphic Organizer comes in 2 different sizes and you have the option of an organizer with lines or without lines. There is an "answer key" to go with all of the passages. This is the "main idea" I had in mind as I wrote it and the main idea that I want my own students to identify. I also included the key details included It is just a starting point/guide to make it even EASIER for you! I have used these activities in my own first grade classroom. All of the texts are leveled by lexile to be grade level appropriate for first grade, but it could also work well with advanced kindergartners or second graders who are reading below grade level. So this can be used with multiple grade levels in a variety of ways and can be differentiated based on ability or need! All of the reading levels are between 200L - 500L (Which is somewhere between Level D and J); it is heavy on Winter vocabulary so having that background knowledge will be helpful for readers. Check out my preview for an example passage to help you decide if these texts are right for your students. Scaffold and differentiate with these passages to fit your kids individual needs. This works perfectly for literacy centers, as can do activities, independent work, small group, whole group, for early finishers or as remediation for reteaching. Gumball Sight Word Packet - First 100 Words!! Be the first to know about new products and freebies! Just click the green “Follow Me” star under my store name on this page. Please leave feedback if you purchase this product; happy teaching :).